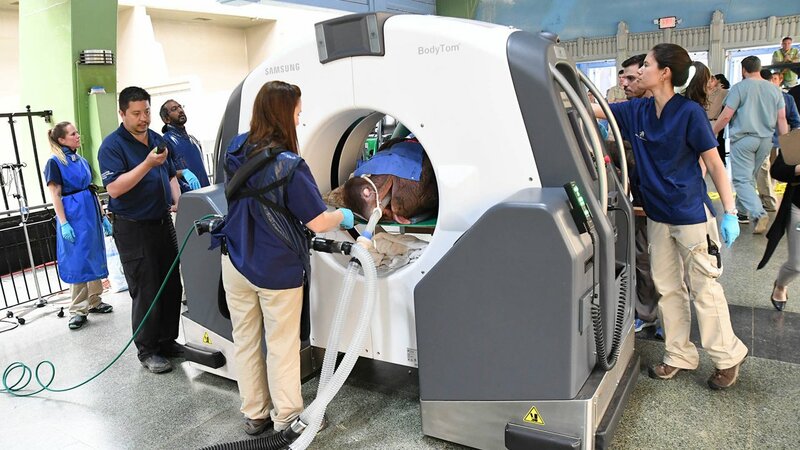 CHICAGO (WLS) -- Brookfield Zoo performed a second CT scan on its 7.5-year-old black rhinoceros, Layla, a week after she received a lifesaving surgery. The scan was done on a BodyTom, the world's first battery-powered portable CT scanner. Officials said the surgery Layla underwent is just as ground-breaking. "To our knowledge, this type of surgery has never been performed on a rhinoceros before," Mike Adkesson, vice president of clinical medicine, said in a statement. Layla underwent the first CT scan, the first ever performed on a black rhinoceros, on April 19. The scan helped veterinarians determine that an impacted, unerupted molar was the source of an infection in Layla's sinuses that lessened her breathing since December 2017. Tuesday's scan helped the team determine next steps in Layla's care. She's now on antibiotics, and doctors will continually check in on her progress. "We are very encouraged by how well Layla has tolerated the procedure," Adkesson said. "In the wild, this condition would have proved fatal, but we are very hopeful that with our advanced medical care we will be able to save Layla's life."